Yes, I made Gulab Jamuns with assorted cookies. My kids buy many kinds of cookies, but never finish those. So we always end up with lot of leftover cookies. Sometimes I throw away the leftover cookies, but sometimes I recycle those by making bajjis. This time I thought different, so made gulab jamuns with these cookies. Trust me, the gulab jamuns turned out perfect and tasted great too! Give it a try and you’ll agree with me! Mix all the ingredients under “For Jamuns” except oil using some milk (use as needed). Make it like chapathi dough. Take small portions of the dough and shape into a ball. These measurements make 32 small balls. Heat oil in a deep-bottomed pan and drop these balls carefully in batches. Fry till the balls turn golden brown in color. Remove from oil and place on a paper towel. Meanwhile, pour sugar and water (for syrup) in a different bowl and heat on medium flame until the sugar mixture boils. Add some cardamom seeds for nice aroma. Leave the syrup until the sugar dissolves well and switch off the flame. Keep aside. Then drop the fried jamuns into the sugar syrup and leave it for some time until the jamuns absorb the sugar syrup. The jamuns can be placed in a refrigerator if you wish to eat them cold. Enjoy the delicious Gulab Jamuns whenever you want! Sending these yummy jamuns to Mythreyee’s “Sweet series - Milk sweets with spongy texture” event. Thank you, Rajeswari Vijayanand and Vij for passing me the “Chocoholic Award”. Thank you, Indranee and Hemabalaji for passing me the “Butterfly Award”. Thank you for thinking about me friends! Ver creative of you to come up with jamuns out of cookies. Nice presentation. Hey Uma very creative idea of adding cookies to it.. looks yum. That's amazing Uma.. I would've never thought of turning something like cookies into gulab jamun. Uma, ur creativity doesnt have limits...wat a way of creating new dishes...gulab jamun looks delicious n lovely presentation..
really....how do u come up with these ideas?great yaar...kudos to u :)yum! Wow, such a recycling mom you are Uma :) He he those gulab jamun re just pretty! There is something satisfying about creating your own recipes right? YOu have done a great job, and very very creative. Hats off! 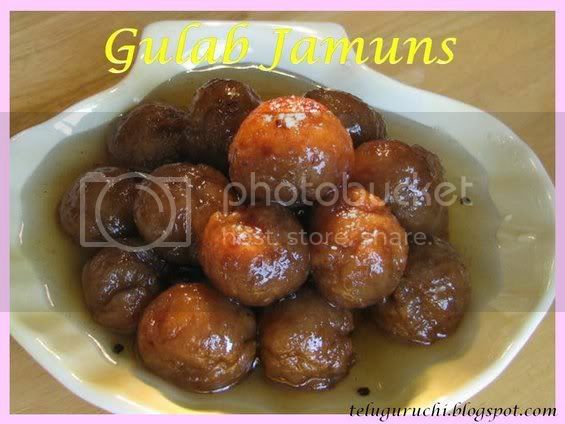 gulab jamuns looks yum yum Uma.. i can feel the softness. love those flamingos.. where did u buy them from? Happy Diwali! I know I have not been posting a lot been caught up with the elections. 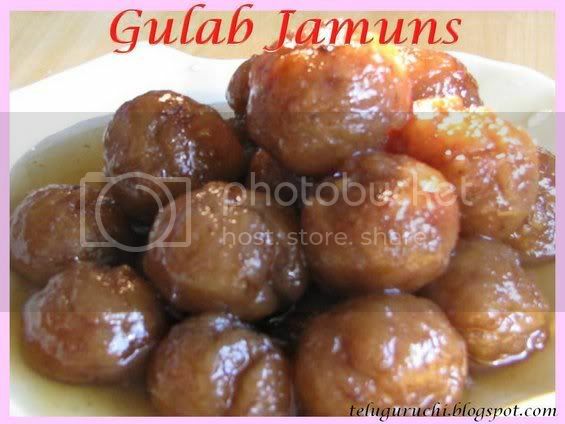 I tried Gulab Jamuns for Diwali 2 methods and I was so disappointed with it. Never knew it would be so tricky to make this sweet. I decided to appreciate anyone who makes this sweet after that. good job. These jamuns look too good! 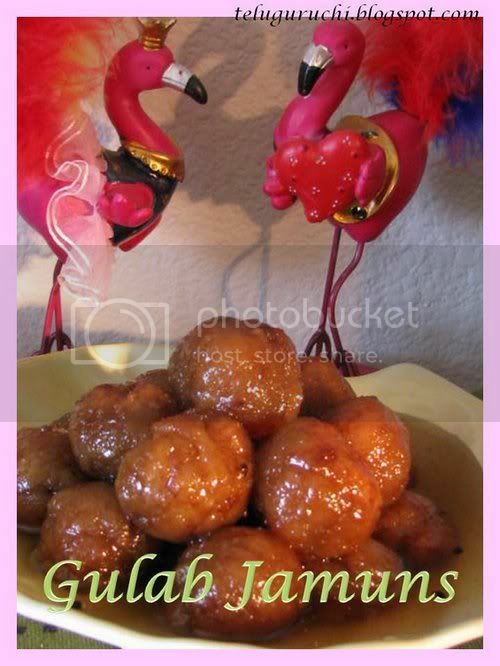 I was wondering reading the title cookies and gulab jamun.thought u had two recipes here..but jamuns with cookis sounds awesome..BTW, your other blog is very useful! That's amazing Uma and I adore your pink flamingos in the top photo! wowowo, recycling cookies. tht is great idea and produces a new dish all together. this is really awesome. thanks for sharing it with all. ooh, very creative Uma! Love the cool idea.. Picture looks perfect.. Very innovative idea! jamun looks gr8. I was wondering what the title meant.Nice way to use leftover cookies.The jamuns look perfect. interesting...have to try these sometime..
well made and well presented. Hi gal, how r u doin' ??? This is a very creative recipe. Looks so good. Never imagined gulab jamuns with cookies. Nice try.... YUM! 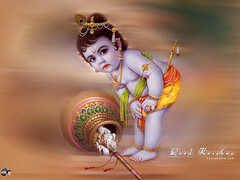 hi uma, i would like to inspire you, chck pout my blog. That is an awesome idea! Really original, and they look great! Wow! that's something truly creative! Innovative to make jamun with cookies.. Lovely Uma !! Looks so yummy !! Very creative....:) Sounds something great!